Incepted in the year 2005, we, “Shree Balaad Handling Works”, are a prominent business entity engaged in manufacturing, supplying and exporting a comprehensive assortment of Lifting Equipment, Pallet Trucks, Hydraulic Stacker and Industrial Cranes. The offered array of industrial equipment is manufactured by our expert professionals using premium quality raw material and ultra modern technology. 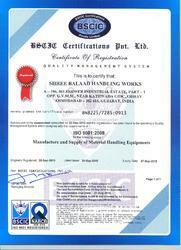 Also, our experts ensure to engineer these components in complete compliance with the international quality standards. The offered range of products is widely appreciated by the clients for its brilliant features such as rigid construction, safe usage, excellent performance and damage resistance. Owing to this, the products are widely demanded in pharmaceutical, chemical, textile, petroleum, information & technology, sugar, steel, food processing and engineering industries, to name a few. We are firmly supported by a high-tech infrastructure facility, which enables us to carry out all the business operations with ease. To ensure the uninterrupted flow of all the activities, we have equipped latest machines, tools, instruments and advance technology at our premises. Further, to carry out all the business operations in a streamlined manner, we have segregated our facility into various departments. These departments hold their specific responsibilities and tasks that are successfully executed by our competent professionals. Further, to meet the variegated demands of customers, we offer the products in varied dimensions, sizes, grades and other specifications which can be customized as per the clients' requirement. Owing to all these factors, we have garnered a huge clientèle all across the Indian Subcontinent. All our activities are supervised by our manager, 'Mr. Ravi Sodagar', who has been the driving force behind the successful journey of our organization in this domain. His valuable guidance, managerial skills and constant motivating persona have helped us to accomplish the all preset goals of the organization within a short period of commencement. Owing to all these, we have mustered a vast customer-base that includes Blue Star Industries Ltd., Reserve Bank Of India., Hindustan Coca Cola, Suzlon Infrastructure Ltd. and Banco Product (I) Ltd.
Manufacturing and Trading of Industrial Material Handling Equipment. We are a prominent organization engaged in manufacturing, supplying and exporting a comprehensive assortment of Lifting Equipment, Pallet Trucks, Hydraulic Stacker and Industrial Cranes. The entire range of products is fabricated using best quality raw material which is procured from the most authentic vendors of the market. Developed as per the international quality standards, our products can also be availed in customized specifications as per the requirements of the customers. From the day of commencement, quality has been the prime objective of our organization. To attain this objective, our professionals manufacture the products using premium raw material which is sourced from the certified vendors of the market. Besides, all our products are strictly developed in tandem with the international quality standards using advanced tools & technology. Moreover, we have a team of quality analyzers, which strictly examines all our products, before and after procurement so as to ensure their quality, flawlessness and zero defect. We have developed an ultra modern manufacturing unit at Ahmedabad, Gujarat which is spread over a large area. For the ease of operation, the unit is segregated into several departments such as production, quality control, research & development, packaging & administrative and sales & marketing. These units are well-equipped with all the modern machinery, tools and equipment that are frequently upgraded to improve and boost up the productivity. We are backed by a team of competent professionals, which helps us in catering the variegated needs of the clients by providing them with a quality assured range of products. Selected after stringent examination procedure, the professionals leave no stone unturned to achieve the best in every process. Our team members frequently communicate with the clients to know about their specific requirements and serve them accordingly. Every single detail laid down by the client is incorporated in the product. We have a team of quality analyzers who thoroughly test the products on various parameters to ensure their quality and flawlessness. Since inception, we are engaged in manufacturing, supplying and exporting a comprehensive assortment of Lifting Equipment, Pallet Trucks, Hydraulic Stacker and Industrial Cranes. The offered range of products is widely appreciated by the clients for its attributes such as rigid construction, safe usage, excellent performance and damage resistance. Within a short period of establishment, we have been able to create a special niche for the organization in this highly competitive industry by providing them with an excellent quality of products. Being a patron-centric organization, we aim to attain the maximum level of client satisfaction. For this, our professionals frequently communicate with the clients to know about their specifications and serve them, accordingly.